Far too often homeowners shy away from making necessary repairs or upgrades to their homes as a result of cost. In some cases avoiding a repair doesn’t necessarily make things worse but no matter what the situation is, avoiding a problem does little more than postpone the inevitable. If you’ve been thinking about making some upgrades to your home’s energy efficiency, but haven’t taken action because you think it will be too expensive, we’ve got some tips for you. When people think about upgrading their homes to be more efficient they usually think of the big ticket items first. It’s true that replacing windows or buying new insulation for your attic can be pricey, but there are steps you can take that work to achieve the same ends on a fraction of the budget. Before you give up on making your home more efficient on a tight budget, read through these suggestions to discover easy ways to reduce your energy consumption. 1. Check your doors and windows for air leaks. If you notice a draft in your home, you may have a poor seal on your doors or windows. In either case, you usually don’t have to replace the doors or windows themselves to remedy the problem. If you have a drafty door, take a trip to your local hardware store. There are many readily available products that can improve your door’s seal. Some of these strips attach to your door; others are designed to line the doorframe. Either way, if installed correctly these replacement strips can close the gaps letting air in from outdoors. If you have drafty windows there are a few steps you can take. If you own your house, consider caulking around the frames to fill in gaps. If you’re a renter, you might want to purchase a plastic barrier to put over the inside of your windows. These solutions are fairly cheap and help prevent drafts by introducing another solid layer between the outdoors and your home. 2. Replace all the light bulbs around your home. Most people already use some CFL light bulbs in their homes, but not everyone realizes just how much energy these bulbs save on a daily basis. CFLs took off because they are able to produce the same number of lumens (or brightness) as incandescent bulbs at a fraction of the wattage. 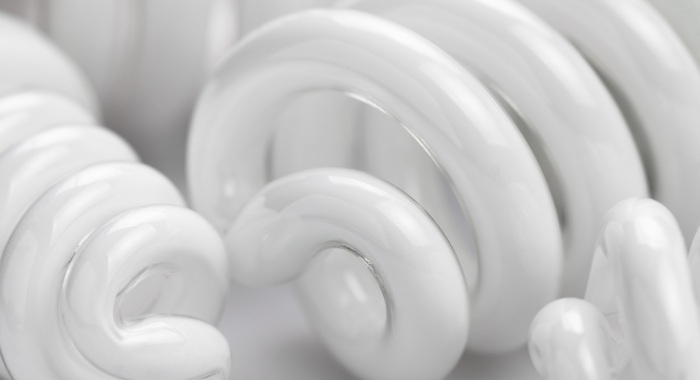 Many CFLs that have the lumens equivalent of a 60-watt incandescent bulb use just 13 watts. Even better, there are many utilities across the U.S. distributing CFLs for free to their customers! That may sound surprising by having customers use less energy is actually a win for many utilities. If more people use CFLs, utilities will have to supply less electricity to the average home, allowing them to reduce the burden on their generation facilities. 3. Buy a programmable thermostat and set it up appropriately. If you don’t already have a programmable thermostat, or haven’t actually set yours up yet, you can save a lot of energy with a small investment. Programmable thermostats allow you to keep your home heating and cooling under control. Manual thermostats require people to physically turn the thermostat on, off, up or down. As a result, many people leave their heat or air conditioning all day when they have a manual thermostat, regardless of whether or not anyone is home. Programmable thermostats let you turn off the heat or AC when you’re away from the home for the day. All you have to do is spend a few minutes creating a profile on the device, instructing it when to turn itself on and off. Following through on just one of these affordable tips can help you save a lot of energy each month. Imagine how much you could conserve by doing all three! The best part is all of these upgrades to your home’s efficiency can be done on just a few dollars. Take control of your energy consumption and bills today!